The Burtons have just moved into a beautiful new home, which just happens to be haunted. Now it's up to you to help them deal with some particularly unfortunate ghosts as you search for Hidden Object through beautifully illustrated rooms. Help the Burtons survive the paranormal and take back their home in Mishap: An Accidental Haunting. Please Note - You may experience graphic issues when starting this game if you have recently upgraded your older computer to Windows 7. 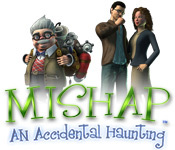 Mishap: An Accidental Haunting is rated 4.0 out of 5 by 32. Rated 5 out of 5 by arnold1049 from WHO YOU GONNA CALL? GHOSTBUSTERS! A young couple have moved into a haunted house. Just about the time the wife is ready to give it up and leave, a kindly scientist appears at their door. He assures them that he can help them get rid of the ghosts. What follows is 8 chapters played in different parts of the house that result in the capture of several ghosts in each location. All the ghosts have stories included about how they became a ghost. There is a stronger, boss ghost in each location that controls the other ghosts. Information is also provided on the boss ghost in each location. The scientist must pull the boss ghost into a machine he has on his back. For the scientist to be able to do this, all HO items must be found, and a riddle must be solved to obtain a part for the scientist's machines. At that point, the last and strongest ghost at that location appears and a final mini game must be played in competition with him. Each chapter contains 3 separate HOS. The first and main one is panoramic and fills almost 3 screens. Within this HOS, there are two openings that lead into off shoots of the main room. These rooms also contain a HOS. The HOS are tough. There is a long list of items to be found and some of them are very small and well hidden. I used the hint button a lot and it did not recharge that quickly. The solution to the riddle is contained in the items that have to be found in the HOS. Warning: you cannot leave a chapter until all items have been found. If you solve the riddle before you have found all the items, the hint no longer works and you may find yourself spending a lot of time randomly clicking until you find the last items. If you miss-click too many times, a ghost punishes you by popping up and making the scene fade as though it is covered with smoke. This effect lasts for a time, making it even harder to look for and find hidden items. Once the riddle is solved, you must execute what the riddle tells you to do. This means you have to find the place in the chapter where the riddle can be done. After this step, you are able to collect a part for one of the scientist's machines. The mini-games were very hard for me. There were several rounds to each game and the games were timed. The games require you to use your mouse exclusively and you must do it very quickly. I have never been coordinated enough to be that good at moving a mouse accurately and quickly, so I got mostly bronze trophies and one or two silver trophies. 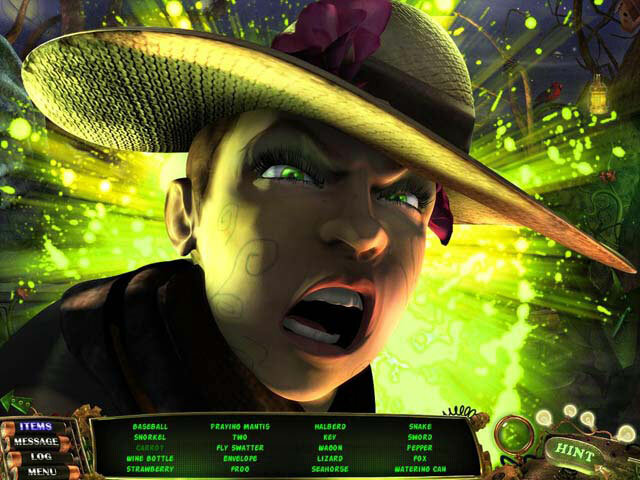 There is a final award to be earned, but in order to win it, you must earn a gold trophy for all 8 mini-games. You can replay the mini-games as often as you want in search of the gold trophy, but I felt lucky just to get through the mini-games and had no desire to repeat them. Therefore, I have no idea what the special award is. The storyline is cute and funny and the voiceovers are excellent. I do not play with music or other sounds. The graphics were interesting and at times dark. The cut-out scenes are on the order of comic book illustrations. The ending is unexpected and gratifying. This game is heavy on HOS and the mini-puzzles are unique. This game was a challenge to me and I think it will be to most players. There is a sequel and I'm ready to play it based on how much I enjoyed this game. 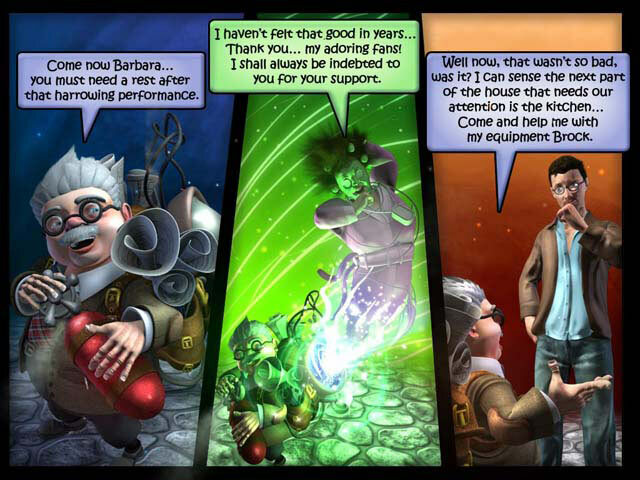 Rated 5 out of 5 by Friar from No Mishap This is an absolutely outstanding Hidden Object Game. True to the original type. No big adventure, no chasing a map, no trying to figure out where to go or what to use in what area. Just plain old search and find with a small story to go along with it. The games within the HOP are also very well done and challenging. This is a must have if you like HOG without everything else. Rated 5 out of 5 by mysterymiss from Fun, fun, fun The most fun I have had playing a game in a long time. Scenes are quick to get up and scan main scene to get full view for HOs. Some items are vertually impossible to find, but there are also ghosts to capture and at least 3 other places to do HOs within the main scene. A ghost per mini HO to capture. Also a riddle to solve that can only be worked out with all the clues gathered. This game kept me on my toes and also kept me at my computer until I had finished as I wanted to know what came next. Once a main area is finished, you compete in a series of mini games with the subject of the main ghost and earn trohies. Great fun. I highly recommend this game to anyone, like me, who wants a challenge and is tired of the normal ghost/spooky house games. The characters are wonderful, graphics are not always clear, but the details are extraordinary. Play this one before Mishap 2 and you will understand the characters etc better. All in all, I hope for a Mishap 3. Am playing this one again as I enjoyed it so much. Definite value for money and hours of fun. Rated 5 out of 5 by enigma5619 from FUN FUN FUN Loved this funny ghostie story game with all its hidden rooms and ghosts and not too terribly difficult puzzles....if u like ghosts and funny bits and a puzzle that requires basic thinking, u have found your game...also part 2 is as good if not better....i do so enjoy the humor of these game makers...also american pickers:the road less traveled is similar...these games are sooo unique! Rated 5 out of 5 by ImaTexican from Love, Love, Love this game! This is such a cute game. I love it! Some of the items are tiny, but you can find them, don't worry. The story is really sweet in the long run. Even the "bad characters" aren't bad, just misunderstood! lol I recommend this game highly. I will be playing it again and again!! Rated 5 out of 5 by Michelle260 from Get's my 2012 Unique award so far! Had to figure out what was really going on here, because there is a lot.But when you have control, what fun it is. Animation, graphics, background voices and music are #1 in themselves. Then you get to the actual HOG scenes and there is a lot to find This game makes me extra glad I have a large computer screen so it can be all taken in. Look forward to it's sister game next. Rated 5 out of 5 by robinbobbin from Very nice game I missed this one on the original release, but I'm glad I caught the daily deal! The graphics are very good, cartoon-style. A couple of the cutscenes are older 3D animation, which never looks great in my opinion. Others had a static comic-book style, where you could wait for the voice over, or just click to light up the next panel. I always skip cutscenes and voice overs, so I can't review the voice acting. 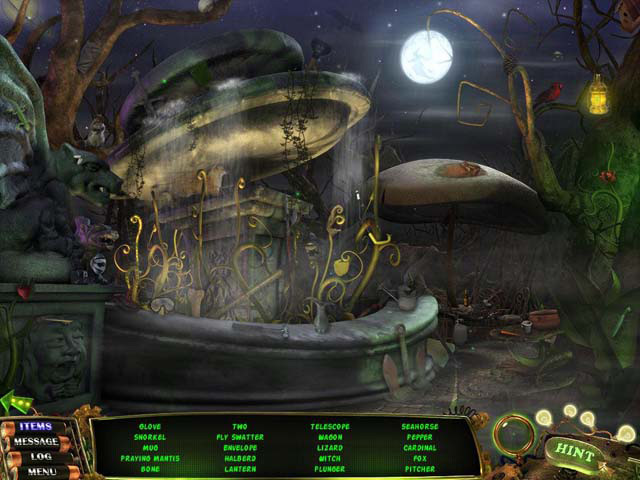 There are a ton of hidden object scenes, with a lot of objects in each one. They were tricky too; not unfair, hide a matchstick under a broom tricky, but finally find it and say "how did I miss that??" tricky. Each chapter has one huge main scene you can scroll sideways through, with 3 doorways into linked scenes that don't scroll. There is not a lot of adventure-type running back and forth, which I liked, and no annoying tasks that can only be done with a ridiculously specific item. You do collect objects, but they are combined into a machine behind the scenes and used at the end of the chapter. You also have to do a hot-and-cold seek game in each scene to catch ghosts, and each chapter has a rebus riddle that tells you to do a small task. The only real challenge of the riddles is to find the area where the task is held; sometimes the riddle gives a clue, other times you have to just hunt until the cursor changes. There are eight mini-games, one at the end of each chapter. They are interesting, and a few I really liked (card game!). You're using the contraptions to help the ghosts with their unfinished business, whatever it happens to be. Most were arcade-style and involved some speedy mouse-work, which is a little harder with a trackball, but I was able to do just fine. One mini-game had a loading lag time that made it difficult to play; I just skipped that one. There is a lot of story, including a mini-story for every ghost, but I liked that nearly all of that was completely optional - it was stored in a separate log area and you had to choose to open it. So when a little way in I figured out the "twist ending", I could skip the rest of the details and diary entries and just play. Maybe next time I will read all the macabre little death stories; maybe not. Best of all, as mentioned above, there are 8 full chapters in the game, and it was an excellent length. I kept getting interrupted, so my very vague estimate is about 4 hours; and I'm a fast player. A very nice game and an excellent value! Rated 5 out of 5 by gg3000 from A very fun game! This game is bright, colorful, and a lot of fun. The HOS, while cartoon-like, are sophisticated and well drawn. The story line is fun and interesting and the Chapters are complex and deep and will prove challenging to the more experienced player while still playable for the "newbies." Rated 5 out of 5 by ciminie from Great Game! I loved this game! It was hard enough to be engaging and had a cute storyline. I also liked the ghosts popping out of nowhere to scare you.